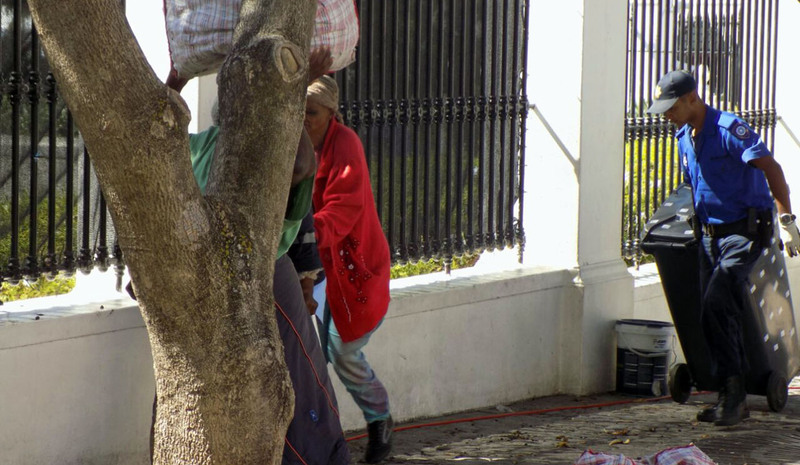 For a group of street dwellers in Cape Town, Parliament is merely a building that has a pavement they call home. By APHIWE NGALO and HLUMELA DYANTYI. As we enter the parliamentary precinct, a convoy of German cars make their way into the large Victorian buildings that house Parliament. This is where the long-awaited State of the Nation Address will commence. With the hype around the address setting in, journalists, photographers, state officials and distinguished guests walk towards the building, moving behind the barricades that separate those who have the privilege of attending the event and those who do not. From within the precinct one can see what looks like a pile of old blankets lying on a nearby pavement. A closer look reveals that inside these blankets are people. Grubby bags filled with clothes and other belongings lean against the bundled forms. While attendees are caught up in the State of the Nation Address, no one seems to realise that the people on this street, on this day, are a reflection of a government that fails to prioritise its people. Shortly after chatting to the street dwellers, the police tell them they need to move on. The City of Cape Town law enforcement officers claim it’s for security reasons. “God forbid if there was a shooting here, what would happen to these people? All civilians are not allowed access to this area without accreditation,” says one of the officers. The street dwellers pack their belongings and wander off, leaving behind the pavement that has become their home. Some of the street dwellers tell us they have been homeless for 10, 20, even 30 years. They decline to reveal their identities or be photographed. One of the women says she fears being photographed as she would be identified by people she does not want to find her. A man we speak to says his life has never been the same since he was released from prison in 1993. He was jailed amid the 1976 riots during apartheid; he is an integral part of South African history ? just like many of the politicians who walk the red carpet today in their fancy attire.